I thought I would show a few pictures of my Patio Garden. It has been a task on it's own to keep it watered. The hot weather is set to continue in this area, we are to get a few thunderstorms but nothing as bad as they going to get in the south. They have been given flood warnings, I hope they are not too badly affected. I have been doing some hand sewing but this is as much as I can show as it's for a Bloggie friends gift! The biggest job of the week was tidying me sewing room. It had been left and left until I could bare it no more. It took my a whole day to get it looking presentable. I don't want to get it in that state again. Your garden is so pretty. How do you keep the slugs off the hostas? I've left you my slug treatment as a comment on this post. 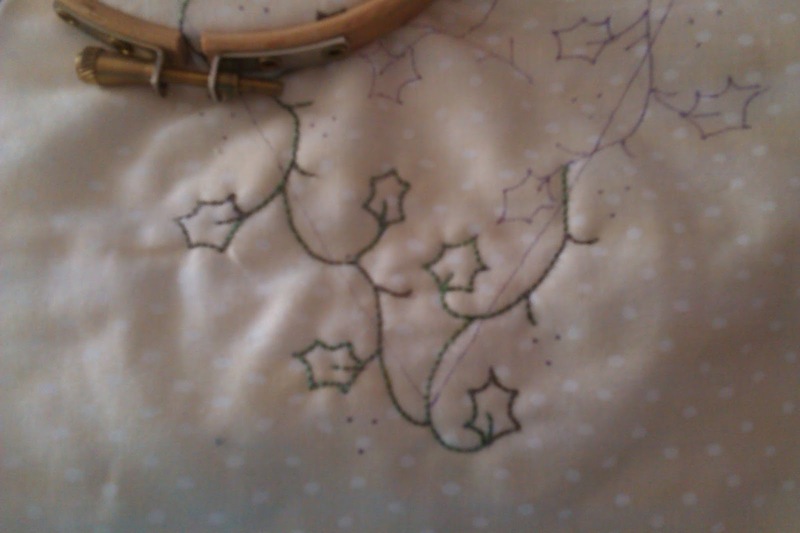 Your stitching is pretty and interesting. Your have a beautiful flower garden; what a nice place to relax it must be. Thank you all for your lovely comments and here is my secret for slug free Hostas: Garlic wash treatment: Crush two bulbs of garlic and steam or boil in one litre of water for three to four minutes until blanched. Strain the mixture and make back up to one litre, then leave to cool. When ready to use, mix one tablespoon in five litres of water and sprinkle on to leaves in late afternoon (in dry weather). Re-apply every two weeks. The mixture dries on the leaves making them unappealing to slugs and snails! I found it on the Bowden Hostas website when I purchasd some of my Hostas. Your garden looks so pretty, onto our third thunder storm of night down here in the south east, surely have had some rain, but gardens sure need it. Your garden is lovely Melanie, lots of pretty flowers, love the bunting to. Can you come and clean up my sewing room please. Melanie, your garden is absolutely lovely!! :) And your stitching is beautiful. Lovely to have a new follower. Following you in return. PS Looking forward to doing the Christmas matchbox swap with you. Please feel free to use my photos and post about it here.